This happy-looking pup seems full of life and cheer now, but he has been through enough suffering for several lifetimes. Born in an abandoned cellar to a stray, Naki’o is incredibly lucky to be alive. His mother died in that cellar, and when little Naki’o and the rest of the litter were found, he had suffered severe frostbite that later caused the amputation of all four feet and part of his tail. For months the pup wobbled around painfully on his uneven stubs, but eventually his vet recognized the need for permanent replacement feet. Without intervention, Naki’o’s legs would eventually have given out and left him immobile. 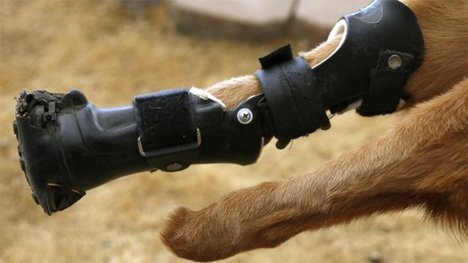 A chance encounter led Naki’o’s foster parent to OrthoPet, a company that specializes in making prosthetic and assistive devices for animals. Although all of the dog’s limbs needed attention, his left hind leg was in the worst shape. The team of carers decided to work on making that leg less painful and more functional before tackling the rest of Naki’o’s problems. 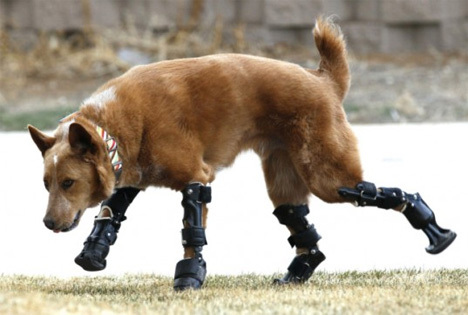 Corrective surgeries had to be performed in order to make the dog’s leg stumps suitable for fitting into prosthetic devices. They had to be evened out to approximately the same size, and painful bone points had to be removed for Naki’o’s comfort. After the first prosthetic device was fitted and tested, OrthoPet went to work creating three more new feet for Naki’o. According to the vets and the rest of Naki’o’s team, it was the dog’s enthusiasm that kept them going. Whenever a change was made to Naki’o’s prostheses, he gave immediate feedback by either using the limb more or trying to avoid using it. After all of his new limbs were in place, Naki’o was finally able to run and play like any other dog. 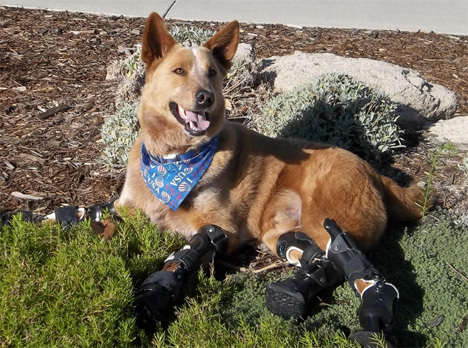 In the end, this pup’s sad story turned into a success as well as a world first: Naki’o is now the first dog in the world to sport four prosthetic limbs.